Use the best ingredients you can afford. Know what you are eating. That means no processed foods. Nothing in a package. If you can’t pronounce it or if it has a laundry list of ingredients, you should not eat it. Even though I have always been a good and healthy eater, these realities now carry so much more weight since we are primarily eating a paleolithic diet of proteins, vegetables, nuts and select fruit. While we have definitely cut back on dairy, we still revel each morning while enjoying a hot cup of (Swiss-water processed decaffeinated) coffee with a heavy-handed splash of organic half and half and a spoonful (or two) of coconut palm sugar. That is never going to change. What we have found is that the less we add to our food, the better it tastes. Keeping it simple in the kitchen means that shopping at a farmers market, eating locally and knowing the people from whom you buy food become that much more important. It’s about simplicity and that particularly rings true when making a homemade breakfast sausage. Yes, that’s right, we’ve gone to making breakfast sausage. Thanks to the cookbook Paleo Cooking from Elana’s Pantry. But why make your own sausage? Because it’s so easy and tastes so unbelievable, you’ll never be able to eat the store bought stuff again! 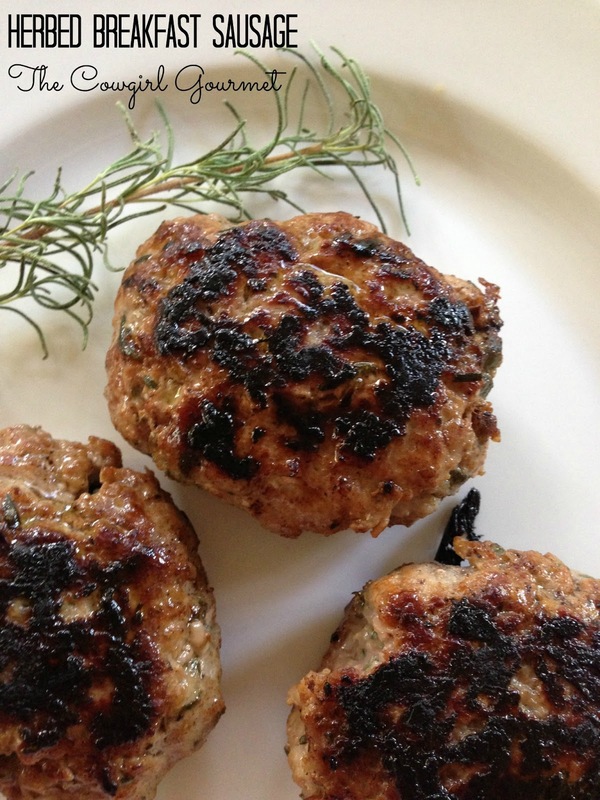 Just add some herbs, salt, pepper and a drizzle of honey to organic ground pork (or turkey) and mix well. Really. You can control the amount of salt and you know exactly what’s in that sausage. Fry it up and taste what breakfast sausage should taste like. Pork and herbs. In perfect harmony. Fried. With a farm fresh egg. Or two. For breakfast. Or dinner. You could try mixing up the herbs a bit, but why, when this flavor combination is so spot on? In a big bowl, add the pork and herbs. Using just one hand, get in there and squish it all around so that the herbs and meat mix up evenly. As soon as it is well combined, stop mixing and wash your hands. Then get a skillet. Add a teaspoon of oil and place over medium high heat. Using 1/3 cup, measure out a serving and finish forming the patty with your hands. Make it thick if that's the way you like it or thinner, if you so desire. Cook 4-6 minutes per side, depending on the thickness. Serve with eggs and enjoy. Store any leftover sausage in the fridge for up to 3 days--the herbs will infuse nicely with the pork--and then cook when you are ready.